Iron Road Brewing is what happens when two geologists (Richard Phillips & Jared Tarswell) with a passion for great beer get together and start a craft brewery. We've teamed up with award-winning brewer Aaron MacInnis to craft delicious, balanced beer that you're going to love. We're conveniently located on Camosun Crescent, only blocks away from Thompson Rivers University. 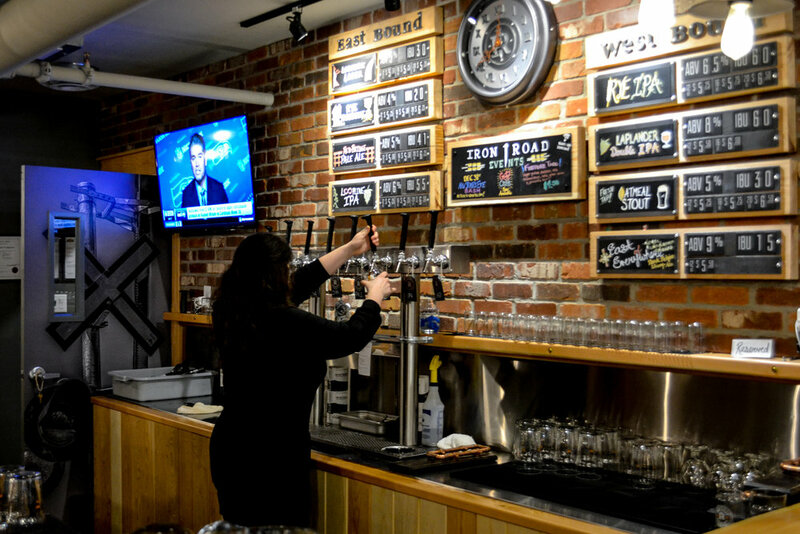 Stop in for cold beer and great food in our 60-person, family-friendly taproom where you may catch a live band playing or see the brewing process up close and personal. Locomotive Lager is a classic Czech style lager using Czech Saaz hops and a dash of Munich and Vienna malts. This beer has a strong malt backbone framed by a crisp and refreshing hop character. Brewed with Pilsner, Carafoam, Vienna and Munich Malts. Columbus bittering hops and Saaz finishing hops. Fermented with wild ales and lactobacillus, and dry hopped with Citra, this tart wild ale is booming with notes of tropic fruits, citrus, and funky goodness. This rustic Saison was fermented in barrels with Belgian saison yeast and matured for 6 months with Brettanomyces Bruxellensis. Oats, wheat and a generous addition of hallertauer mittlefrüh hops help support the vanilla and spice provided by American oak. Brewed with Pilsner malt, Simpson’s Light Crystal, Simpson’s DRC and Castle Biscuit malt. Cascade and Columbus hops at flameout and dry hop. The long cold months are finally over, and we're rolling out the springtime beers! Juice Train will be on tap throughout the spring and summer, featuring varying fruits, the first being pomegranates. The base beer is a sour saison brewed with Pilsner Malt, Wheat, and Oats. Spicy notes from the Belgian Saison yeast are accompanied by a bright, tart lactobacillus fermentation. Loop Line IPA is a light bodied, aromatic, hoppy beer. The fruit forward Citra, Mosaic and Ella hops were all used at zero minute and dry hop to make this a hop bomb. We use Golden Naked Oats in the malt bill to balance the hops and add to the fruity character. Brewed with Pilsner Malt, Wheat Malt, Oat Flakes and Golden Naked Oats. Mosaic, Citra and Ella hops at zero minute and dry hop. The beer is rich with a big body. It has a complex malt bill leading to notes of roast, chocolate, coffee, licorice and dark fruit. Brewed with Pale, Biscuit, Smoked, Roast, Chocolate, Pale Chocolate, RRC and Coffee malts. Bittering and mid-boil additions of Columbus hops. Can’t decide? Try out tasting flight which includes four 5oz glasses. Tri-coloured tortilla chips with fire roasted tomato salsa. Three dips, salsa verde, fire roasted tomato salsa and guacamole. Served with tri-coloured tortilla chips. Beer & Cheddar cheese dip, spiced with Mexican chile peppers, garnished with green onions. Served with tri-coloured tortilla chips. Tri-coloured tortilla chips with a blend of Cheddar and Monterey Jack cheese, hot banana peppers, pico de gallo and green onions. Tri-coloured tortilla chips with a blend of Cheddar and Monterey Jack cheese, fire roasted corn, crumbled Feta cheese, cilantro and drizzled with house crema. 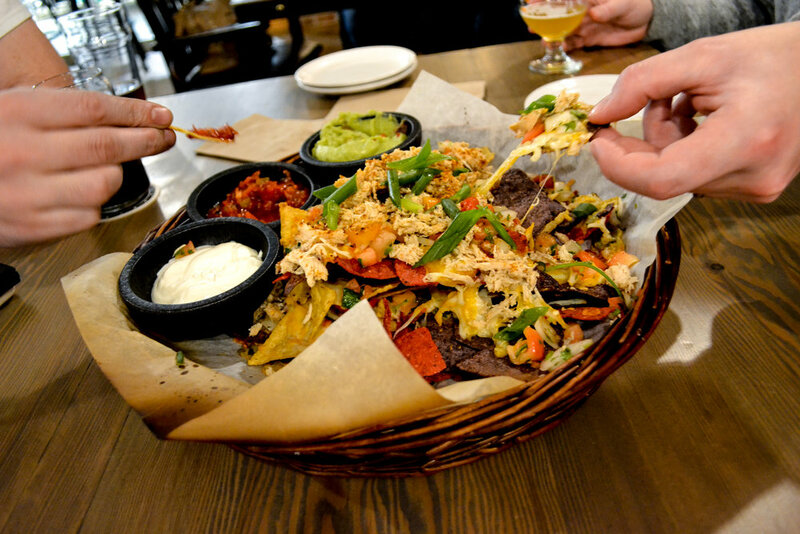 Tri-coloured tortilla chips with a blend of cheddar and Monterey Jack cheese, topped with our house-made 4 bean & beer white chilli. Housemade chorizo, pulled pork, shaved steak, or lager shredded chicken. Fire roasted tomato salsa, salsa verde, sour cream, Beer Queso, or guacamole. All nachos are served with sour cream and salsa. White bean and Pale Ale chilli base with red kidney beans, black beans, pinto beans and fire roasted corn. Topped with Mexican chile peppers, spice and green onion. Served with a cheddar-corn biscuit. 5 mini bean & cheese empanadas baked with a blend of Cheddar and Monterey Jack cheese, topped with housemade chorizo, pico de gallo and green onions. Drizzled with house crema, served with salsa verde. Fire roasted corn, black bean and avocado salad with a lime-cilantro vinaigrette, topped with Feta cheese. Served with grilled flour tortillas. Ask your server or check the chalkboard for today’s featured creation. Double-corn tortilla, housemade chorizo, cheese blend and pico de gallo. Double-corn tortilla, seaweed salad, raw ahi tuna, cabbage slaw, house crema, black sesame seeds. Double-corn tortilla, pepita pesto, carrot, onion, sweet potato, turnip, squash, goat cheese, balsamic glaze, cilantro. Double-corn tortilla, shredded chicken, mole sauce, Feta cheese, Pale Ale pickled onion, cilantro, lime. Grilled flour tortilla, caramelized onions, shaved steak, BBQ sauce, blue cheese, green onion. Grilled flour tortilla, pulled pork, smoked Cheddar, jicama carrot chile lime slaw. Grilled flour tortilla, cold poached shrimp, pineapple sauce, cabbage slaw, house coconut lime crema, cilantro, lime wedge. Grilled flour tortilla, beer battered cod, cabbage slaw, house crema, cilantro, lime wedge. 2 mini cheese quesadillas, served with tri-coloured tortilla chips and salsa for dipping. Fried dough pastry, tossed in cinnamon & sugar. Served with a spiced Mexican chocolate sauce & caramel dulce de leche. If you'd like to get in touch with us, book our taproom for a private event, or get Iron Road beer in your restaurant or bar, fill out the form below. © 2019 IRON ROAD BREWING CO. ALL RIGHTS RESERVED.